Samsung refrigerators have self diagnostic error recognition systems built in. If your Samsung fridge detects a power outage, starts flashing the display icons, begins blinking, or shows a fault code message on the display, it is identifying a problem within the system. These codes and messages will display where the temperature usually is shown instead of showing the fridge and freezer temperature. This Samsung refrigerator error code page is for the following error codes: 88 88, 83E, 85E, or 86E. All Display Icons are FLASHING. Power Outage. The Error PC Er. The Error OF OF. The Error 1E, SE, or 5E. Door Alarm. 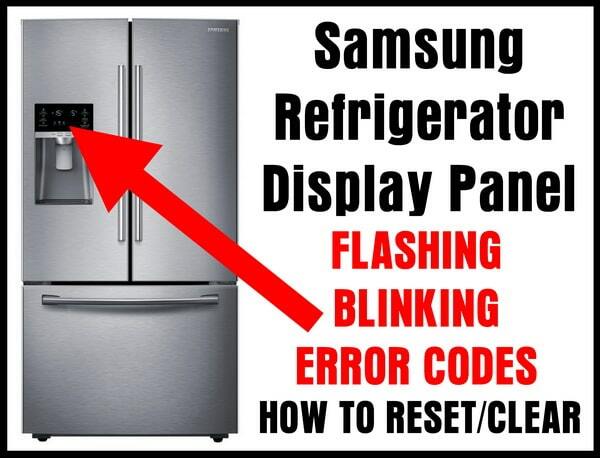 NOTE: If you are looking for the full Samsung Refrigerator Error Codes page, then check here for ALL error codes a Samsung refrigerator can display and how to fix them. This error code is telling you of a communication problem with the door and the main control unit. The wire harness under the top left door is not connected properly or needs to be reset. You will need to remove power to the fridge and check the wire harness above the door. Simply disconnect and then reconnect the wire harness. Then plug the fridge back in and the error code will clear. When your Samsung refrigerator shows OF OF or O FF it is in the Cooling Off or Demo Mode. Check this page for instructions detailing How To Get a Samsung Refrigerator out of the Cooling Off or Demo Mode? How to Get Samsung frige Out of OFF Demo Mode? The temperature on your Samsung refrigerator will flash or blink if the temp inside the fridge goes over 59°F. When the temperature rises above 59°F the display is warning you of the temperature rise and will blink and a bell sound will be heard. Change the temperature to a lower setting and the flashing display panel will stop when the refrigerator cools below 59°F. NOTE: This may happen if the door is left open for too long. If all the icons on the refrigerator display panel start flashing after the fridge is plugged into power… The flashing is completely normal as the Samsung refrigerator is running a SELF DIAGNOSTIC TEST and will stop flashing when the test is complete. When you remove an electrical or electronic component or part from the fridge, (ice maker, fan, switch, damper) within an allotted amount of time an error code will appear. To clear the error code simply unplug the refrigerator and install the part that you removed. Plug power back in and the error code will be clear. A power outage will make your Samsung fridge show the errors 1E and or SE. If this is the case, simply press the power save and lighting buttons for 10 seconds and the error will clear. OR… press the fridge and freezer buttons at the same time for 10 seconds to reset the control panel and clear the error code. Need help? Let us know the model number of your Samsung refrigerator and the error or issue you are having and we can assist you in troubleshooting the problem. PC Ch is flashing and will not turn off. How do you turn this off? To clear PC CH error/fault code: Hold the Power Freeze and Vacation buttons together for 15 secs and it will reset. My Samsung refrigerator model rt40faredsa has just stopped working for almost a week now, and I just called few technician we have around and they all seem to be confused because they just can’t find the problem with the refrigerator. Need your help guys. I had a power outage two days ago and now my Samsung RF4287HARS is completely thawing out. It’s getting warmer and warmer by the second, all ice had melted and the freezer is no longer freezing, and the fridge part is really warm. What do I do? Please help! I have a samsung model RFG296HDWP/XAA. Came home tonight after a hour power outage. Everything was fine before this. Now it has a 8 E flashing. What does it mean and what do I need to do to fix the problem? Thank you. My refrigerator RL41HCIH is no longer working properly. – Activates and deactivates the “Super Frooze” function one more times in a minute. – After a few minutes, “Super froze” remains active and the freezer temperature drops to -29 degrees Celsius. – The “On-Off” button does not work. – The “Alarm on” button does not work. I tried resetting by pressing “Vcantion” + “Super Froze” simultaneously for 10 seconds. The display resets, closes the display for a few seconds, then turns on and takes it from the end with the super-frost activation. What can I do under these conditions? My fridge had a code of 66 E, I pressed and held down Coolselect and Energy Saver at the same time and it reset and is working perfect again!!! We have ‘bars’ in our display panel and the 4th bar is blinking. We do have water but no ice and no light. I think our model number is RS263TD. Two door. I have a fridge that was not cooling. I unplugged it for 24 hours…. when I plugged it back in 22e started flashing on the door… any suggestions? I had the same problem with my Samsung fridge temperature light blinking. After reading a few posts, I decided to unplug my refrigerator for 24 hours to allow the ice suspected on the condenser to melt, IT WORKED!!! No service call was needed in my case. hi I have Samsung Model # RF28HMEDBSR 4 door refrigerator on the display its showing freezer off and cooler off on the display I tried to re set by holding cooler and freezer both at the same time even though its not working if I change it manually its going back to off mode with in seconds . What do you when the fridge is affected by a power surge/spike? Samsung RF28HFEDBSR ice maker and freezer not cooling. On display flashing “0” (zero) about 4 days. I try reset but nothing happen, Please someone help me. Fridge works good. Samsung RS2556SH keeps flashing the refrigerator temperature which 40 degrees. I tried the push both power buttons at the same time but that did nothing. Then I unplugged it and now it says the temp is 59 in fridge and 11 in the freezer. So not sure if this will fix it or not, I tried to lower both temp back where they should be but they went back to the higher degrees. I have a Samsung RD268abwp. On the display it show 88 88. No other lights. None of the buttons work. The top line on the first 8 on the fridge side flashes. – Unplugging the fridge & plugging it back in. – Turning the power off at the breaker for 10min, and turning it back on. 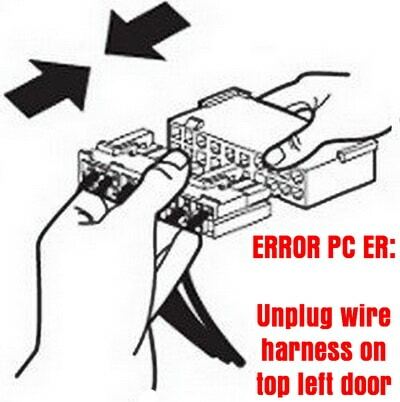 – Unplugging the fridge, then disconnecting the wire harness on top of the left door; reattaching it and plugging it back in. Purchased last year, and it went off warranty 3 weeks ago!! Any thoughts on a repair? With this code, will the food stay cold or spoil? I have a Samsung American fridge freezer, an error has occurred and I have researched the error and it is a defrosting error. Temperate is showing too high in the freezer at 23. The freezer itself is on and working fine. It is not 23 as it is freezing in there. However it keeps beeping due to the error and keeps showing 23 even though I know it’s in -degrees. How can I fix this and stop the irritating beeping? Samsung RH269LBSH/XAA freezer door left open. Fridge and freezer stopped cooling. Repairman said replace main electronic control board. Did that; no cooling. Took interior apart and found lots of ice inside behind panel. Unplugged, defrosted all ice and replaced fridge-temperature sensor just in case. Plugged in, waited 5 minutes and pushed power cool and power freeze simultaneously. STARTED COOLING!!! Fridge dropped down to 38 * and freezer to -04*. Great for two hours at which time we unplugged and plugged in our “cool select zone” drawer. Fridge door open for half hour with temp rising to 68*. Plugged back in; freezer dropped back down to -04*. However fridge will not cool; unplugged cool select zone plug and fridge still won’t cool. What could be wrong? Thanks anybody. Samsung RT60KZRSL1, Temperature display blinks and error “E” displays. We had a power cut and when the American Samsung fridge freezer came back on it is blinking. It is blinking to the bottom right hand side of the number. Which shows on your page as cid three. The model number is rsh 1 fbrs. Are you able to hold the 2 top buttons for 10 to 20 seconds to clear the blinking from the power outage on your Samsung refrigerator? Tried holding the buttons down for twenty seconds. Still nothing. Which 2 buttons did you press and hold on your Samsung refrigerator? Try unplugging the fridge for 30 seconds to 1 minute and it MAY reset. My Samsung fridge RH269LBSH/XAA not cooling correctly. Cool Select Zone drawer cools and top of freezer 38 degrees bottom of freezer freezes fine. After disassembly found lots of ice in fridge around coils and fan. What could be causing this? Also just replaced main control board but not solving the problem. We have Samsung SR-L36168 fridge/freezer bought around 2005. Never had any problems with it until today. The lights at top 1-5 keep flashing on and off. The power button appears to stick when pushed off and on. Is it repairable? I removed the ice maker completely because it was freezing up. The refrigerator and freezer compartments are running but the control panel on the door is blinking and short vertical and horizontal sign on the refrigerator indicator but the rest of the panel is blank. We had the temp rise to almost 80 while removing the ice maker and it now down to 50 and still falling. How can I get the control panel to operate properly. Samsung RB215ACWP bottom freezer w/ice maker. I have a french door samsung RS263TDP i unplugged for 2 days. I plugged it back on and there is a single line segment blinking. I tried doing all the resets but was unsuccesful. Freezer and fridge working fine. Any suggestions? The line that is blinking is the 3rd one from the bottom up on the fridge cooling side. We just had a electric surge like a blink and now the ice maker motor won’t stop going around can anyone suggest what I can do to stop it before it burns out motor? My. Samsung refrigerator is blink 33 e.error what do i do? Hi Amanda, press both Power Freeze and Power Cool buttons for 10 seconds and this should reset your LCD display. I had the same 33 E error code and that sequence work for me. I have a French door Samsung with 23E error how do I troubleshoot this? Samsung Model number rf28hdedbsr flashing 40 E.
i have a samsung bottom freezer. bottom freeezes ok but the upper will not cool. the fridgerator light shuts off. makes ten beeping sounds every few minutes. mdl #rb2155bb/xaa. i replaced the upper fan still not working. Previous post: How To Drain A Water Heater? Next post: Fireplace Fills House With Smoke – What To Check?